2018 is here and the Beamdog team is back in full swing! The 2.5 update beta wraps up today. We’ve had lots of amazing feedback from players about the features & fixes added, multiplayer stability, and what players would like to see in future patches. What’s next for the update? The team is currently going over all the feedback players have given in the Beamdog forums, Google Play, and through the 2.5 update beta survey. Developers are hard at work fixing issues found by the community and adding more fixes to what will become the 2.5 update final release. We’ll have more to share timeline-wise as we get closer to release. In the interest of making sure all our 2.5 update beta players savegames remain compatible, we’re keeping the beta branch open until the full patch release. Until 2.5 is released, you will have access to the beta. 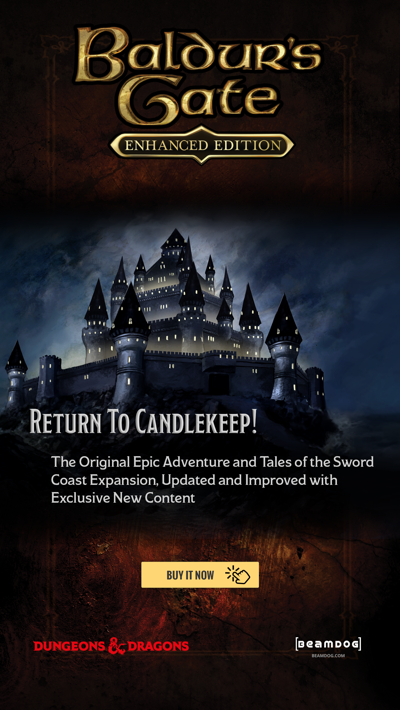 When 2.5 is released, Siege of Dragonspear will also see an update. If you haven't already filled out the 2.5 update survey, this is a good time to do so! We'll be closing off the form next week, so if you're hungry for that Beamdog forum 2.5 beta badge, let us know about your experience here. Our weekly Twitch livestream starts back up this Friday! 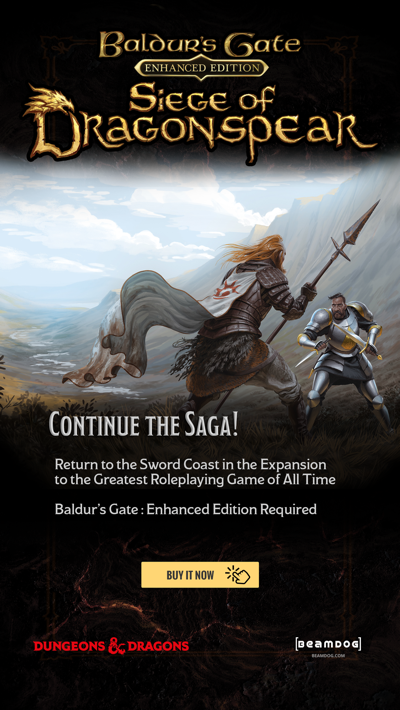 Join Beamdog CEO Trent Oster and Studio Director Phil Daigle to find out about the next Neverwinter Nights: Enhanced Edition Head Start update and the latest Infinity Engine news. We’ll be giving away t-shirts and possibly a key or three, so join us at 10am PST, Friday! If you missed out on all the holiday sales, now’s your chance to remedy that. All our Enhanced Edition games, soundtracks, & DLC are on sale at GOG. Baldur’s Gate: Enhanced Edition & Baldur’s Gate II: Enhanced Edition are both 75% off! And don’t forget to tune into this year’s Awesome Games Done Quick on Saturday the 13th! They’ll be speedrunning Baldur’s Gate II: Enhanced Edition around 10am! 2018’s going to be a great year and we’re glad to have you all along for the ride. where we can see 2.5 patch progress? Can you please fix this bug? what players abuse on speed runs: player surround yourself with summons close to wall, then summon a bear behind wall and use portal... https://www.twitch.tv/videos/140441617 in 12min25sec.